It used to rely on experts to write its opinion pieces and would scrupulously fact-check every column. Sadly, those days appear to be over. 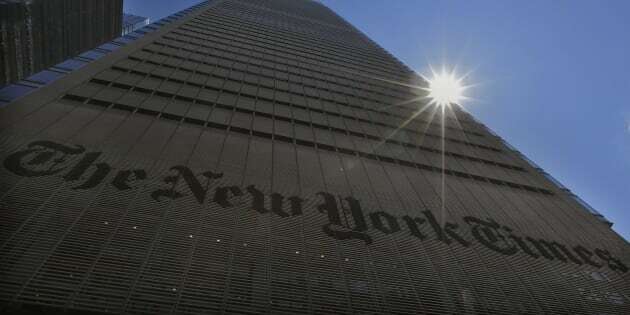 The sun peeks over the New York Times Building in New York Aug. 14, 2013. I know that the Internet era has meant hard times for newspapers but I didn't think I'd ever see the day that The New York Times would lower its standards and resort to what is essentially tabloid journalism. I'm referring to a recent opinion piece titled "Relax, You Don't Need to 'Eat Clean'" that appeared in the Times exhorting people to stop worrying about what's in their diet and to basically eat whatever they want. In this case, the author was not an expert in any field related to his chosen subject. Rather, he was identified as Aaron Carroll, a professor of pediatrics at Indiana University School of Medicine. Professor Carroll's shaky thesis is that we consumers have become overly concerned with the contents of our food and thereby taken the pleasure out of eating. He purports to knock down as false or overblown concerns some of us have with salt, fat, gluten, MSG and GMO foods. As for salt intake, Professor Carroll's advice borders on the negligent. He suggests that the average consumer's daily intake of "just over" three grams of sodium hits the "sweet spot" for health. After conducting "extensive" research with Dr. Google, I learned that the average daily sodium intake is not "just over" three grams but actually closer to three-and-a-half grams. More importantly, Dr. Google informed me that the American Heart Association recommends a maximum of one-and-a-half grams per day. As for salt intake, Professor Carroll's advice borders on the negligent. Even if we adopt the higher maximum of 2.3 grams recommended by the U.S. Department of Agriculture, that is still a far cry from 3.5 grams. More importantly, given that the average is 3.5 grams, millions of consumers are ingesting far greater amounts, amounts that put those with already-elevated blood pressure at risk of increasing it, which can result in cardiovascular disease. Dr. Carroll goes on to give the green light to daily bacon consumption, indicating that such a diet would only increase one's absolute risk of colon cancer by less than one-half of one per cent. His observations, however, fail to take into account the other risks entailed in eating processed meats, including the ingestion of a laundry list of unpronounceable chemicals and even more salt. Carroll also makes passing reference to fats, which he says were once demonized. What he fails to note is that they were once demonized, in part, because included among their numbers were trans fats. If it hadn't been for those folks Carroll labels as worrywarts, we'd still be consuming such dangerous food industry concoctions. Even with the elimination of trans fats, a high-fat diet is still not advisable for those wishing to avoid heart disease. The good doctor refers to what he calls the panic-du-jour, a label he hangs on those without celiac disease or a wheat allergy who are nevertheless trying to avoid gluten. He appears to dismiss gluten sensitivity outright as a thing, notwithstanding that the jury is still out as to whether or not this is indeed a real condition. Personally, I took offence at Professor Carroll's statement that gluten is the latest trend following the MSG "panic." Carroll says that MSG is basically harmless and we don't need to waste effort in trying to avoid it. Carroll's trivializing of MSG complaints is highlighted by his specious observation that food companies long ago dropped this additive from their products. I don't know what universe he shops in, but a quick review of my local grocery store shelves reveals dozens if not hundreds of food items containing MSG or ingredients that contain the additive's problematic chemical like autolyzed yeast extract and hydrolyzed soy protein. Finally, Dr. Carroll takes on the GMO controversy and outright dismisses it. Like the good doctor, I have little-or-no expertise in this field, but I wouldn't be so quick to dismiss people's concerns, especially if my only evidence was a poll of scientists in which most said GMO foods were safe. In the end, however, my quarrell is not with Dr. Carroll. He's entitled to his own opinion, although not his own facts. My complaint is with The New York Times, a once-august publication that used to rely on experts to write its opinion pieces and would scrupulously fact-check every column. Sadly, those days appear to be over. CORRECTION: A previous version of this blog referred to the average daily salt intake, when it should have referred to sodium. This version has been corrected.